Every spring, local waterways and woodlands receive a clean start as thousands of volunteers come together for the Alliance for the Chesapeake Bay’s Project Clean Stream, the largest annual volunteer cleanup event in the Chesapeake Bay region. This year, Project Clean Stream officially kicks off on April 1, 2017 for its 14th year of bringing together volunteers across the vast Chesapeake Bay watershed in a day of service to clean up trash from rivers, streams, creeks, and parks. Alliance and MOM’s Organic Market employees hold bags of trash they picked up from a local stream at a PCS cleanup. Project Clean Stream began in Baltimore County in 2002 and has grown from a small community event to a Chesapeake Bay watershed-wide effort in all 6 Bay states and the District of Columbia. Deeply rooted in the Alliance’s mission, Project Clean Stream is a signature Alliance program. The Alliance coordinates local site cleanups, trains site captains, and provides cleanup supplies such as trash bags and gloves and arranges trash removal after the cleanup work is finished. But Project Clean Stream’s true success is in our strong partnership network within the Chesapeake community—watershed organizations, community groups, schools and universities, houses of worship, and businesses—who join the Alliance in hosting thousands of cleanup sites. Thanks to our partners across the Chesapeake watershed, 2016 was our most successful year ever with over 74,000 volunteers turning out. 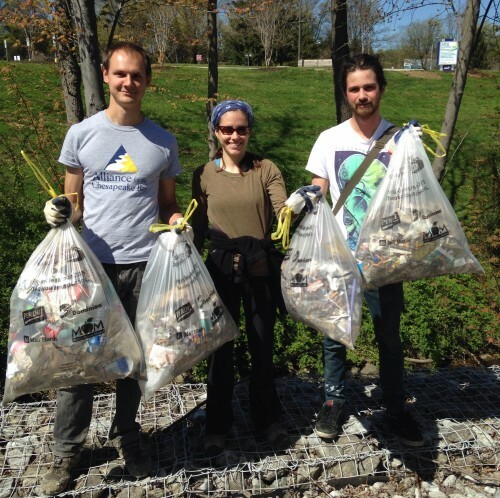 This year, the Alliance hopes to continue to expand its efforts by rallying as many as 100,000 Project Clean Stream volunteers to remove 4 million pounds of trash at 4,000 cleanup sites! In order to reach our ambitious goals, the Alliance will need help from all regions of the Bay watershed, New York to Virginia. In 2017 we are committed to continuing to engage more local businesses to support Project Clean Stream. The Alliance knows that businesses play a critical role in protecting and restoring our environment and that their employees welcome hands-on opportunities to volunteer to improve their own local communities. The Alliance’s Businesses for the Bay (B4B) membership association encourages businesses within the Chesapeake Bay watershed to take voluntary and measurable actions to support protection and restoration of the Chesapeake Bay and to help the public understand the valuable role the business community plays in sustaining the health of the Chesapeake Bay and its watershed. By getting involved in Project Clean Stream, businesses can achieve their sustainability goals, demonstrate their commitment to the communities they serve, and give their employees an opportunity to volunteer and make a difference. Through Project Clean Stream, the Alliance works directly with businesses to coordinate cleanup sites and provide a positive and meaningful experience as stewards of the environment—improving water quality as they care for their neighborhood creeks, streams, and rivers. “Businesses for the Bay members often tell me how excited they are to have the opportunity to get outside, get dirty, and bond with their colleagues at cleanup events, all while making a lasting difference in their communities and receiving recognition for their efforts,” says Corinne Stephens, Alliance Business Partnerships Manager. In 2016, over half of all Businesses for the Bay members were involved in Project Clean Stream or other steam and park cleanups. Local grocery store, MOM’s Organic Market, sets the bar high. As a Businesses for the Bay Member and Project Clean Stream Sponsor, MOM’s also adopts local sites near all 15 of its stores and voluntarily maintains them through trash cleanups and invasive plant removal in every season throughout the year. There is no doubt that the initial impact of Project Clean Stream is a cleaner, safer, healthier, and more beautiful Chesapeake watershed. But the goal of Project Clean Stream aims even deeper. Project Clean Stream encourages participants to become stronger and long lasting environmental and community stewards. By connecting people to their local waterways, they see how their own daily choices, like proper litter disposal, can impact waterways. As each volunteer becomes committed to their local stream and inspires others to do so, we find that Project Clean Stream’s streams stay clean! This year, cleanups take place throughout the spring from March 1st to June 9th. We are grateful to our 2017 Project Clean Stream sponsors: BGE, Digital Ink, Dominion Resources, Inc., MOM’s Organic Market, Perdue Foundation, and Virginia Association of Soil and Water Conservation Districts. If your business is interested in getting involved in Project Clean Stream or becoming a Businesses for the Bay Member, please contact our Business Partnership Manager, Corinne Stephens at cstephens@allianceforthebay.org. To become a Project Clean Stream volunteer at a site near you, or to register or host a cleanup site in your neighborhood, visit http://bit.ly/2lhwRmK or contact Ted Wolfe at twolfe@allianceforthebay.org or 443-949-0575. Be the difference in your community! Read the article on the Bay Journal’s website here.